Dylan Dyke scored 22 points and Owen Porterfield added 10 more as the MVRHS boys basketball team downed the Sturgis East Storm, 65-46, on Friday at the Hyannis Youth and Community Center, to give Mike Joyce his 200th win as Vineyard head coach. “It feels pretty good, pretty good, it’s been a long road,” said Coach Joyce, who is in his 16th season coaching the Vineyarders. Heading into the game with Sturgis East, the Vineyarders were missing starters Rammon Dos Santos (shoulder) and Jared Regan (concussion) and Aiden Rogers and Talon Russillo were out sick. Leo Neville and Parker Ben David came up from the JV team to give the Vineyarders some much-needed minutes. 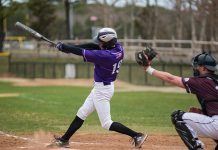 The Vineyarders (5-4 overall and 4-3 in the Cape and Islands League) return to Hyannis on Monday, weather permitting, to play the St. John Paul II Lions.